Q: How can I support Mayfest? A: Kids love their class games…you can sponsor the game! Rented games and rides are one of the largest expenses for Mayfest. Please click here to sponsor a game or ride in your child’s name. Kids eagerly wait to hear their name announced as a raffle winner…you can donate the prize! Donations of all kinds are requested and much appreciated. Second only to the treasured “teacher-experiences,” kids love the chance to win tickets or memorabilia for their favorite sports teams, the latest and greatest toys & gadgets or memorable family experiences. Click here to donate specific prizes. Don’t see a prize you want to contribute, simply add it to the list. No time to source or buy a prize? Make a monetary donation for the exciting and profitable raffle here. 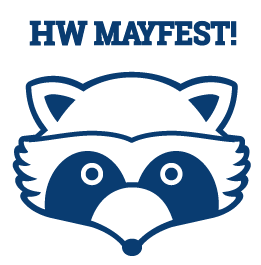 As with many HW events, Mayfest is made possible by our generous parent community. Thank you in advance for your continued support of this beloved annual tradition! Stay tuned for more information on volunteer opportunities, ticket purchases and more! Contact Leigh Sears with general Mayfest questions: leighsears@gmail.com.